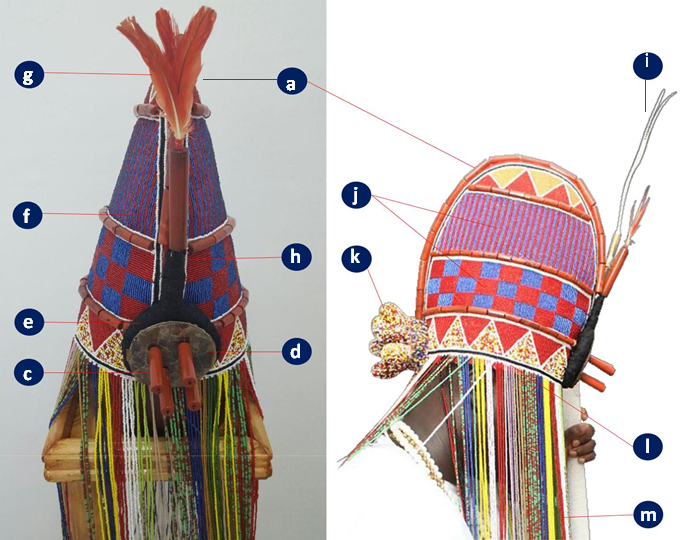 The AARE is an ornamentally embellished sacred and symbolic crown which the Oonirisa wears once in a year during the Olojo Festival's cultural procession. The sacredness and authority of this beaded Crown can be traced to the first King that ruled the whole world. He is called NIMROD - by the Hebrews, LAMURUDU as known by the Yorubas or ARAMPHAEL - as called by Arabs (Ora Ife onile ina). He ruled the whole world ruthlessly with the exhibition of the power of the Sun and Fire and without recourse and respect for OLODUMARE, the Almighty God. Consequent upon Nimrod's confrontational attitude to the Almighty, God raised Oduduwa - the Deity of prayers (ti oba ina ja, o da ina,o ba oorun ja ,o da orun) he fought fire and conquered fire, fought sun and conquered sun. Oduduwa is called Dua by Arabs, Adura by Yorubas and Adua by most ancient tribes of the world. He neutralized subdued, conquered and totally eliminated Aramphael who never wore the sacred Aare crown. But Oduduwa was the first to wear the crown that descended to the earth from Oke Ora hills in Ife. ODUDUWA's mandate is to establish structures and make the world a better place for mankind. Thus during his second coming through chain, unlike his first coming as a spirit being in charge of prayers in the presence of Olodumare -“Olu odu to mo Ade Are”. OODUA became the first beaded crown wearing King in the world - THE AARE CROWN. Oduduwa hereafter, established the royal ruling system of governance in the world whilst the beaded crown became an inheritance of Oonirisa in Ile to n fe - ILE-IFE. This is IFE OOYELAGBO.